Would your students have been able to do your assignments 20 years ago? 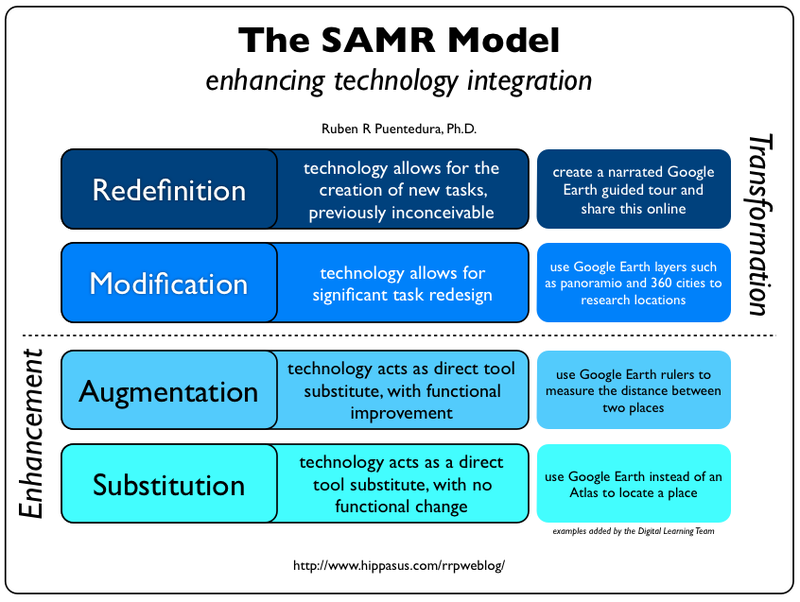 Ruben R Puentedura’s model for enhancing technology integration. It got me to thinking about where my teachers are on the continuum of integrating technology. Are their “projects” innovative or just tied with the shiny bow of new technology? Make-a-video projects: Redefinition – for example, kids are able to teach each other the information asynchronously through videos uploaded to YouTube. Writing in Google Docs: Augmentation – kids are now able to edit a document all at one time, so they are engaged differently, but the way it is mostly being used I would say is in the style of digital worksheet or instruction document. Science research posters: Augmentation – kids are using sophisticated programs to make digital posters that get printed, but there is no change to the content or process. How could a teacher test if their project was transformative? One simple question: Could a student have completed your assignment as is 20 years ago? I do think there are non computer lessons worth keeping. Graphing data by hand can be very instructive for students to learn to organize their information and test if they understand why each point is plotted each place. But if 95% of your curriculum is substitution, then you are preparing students for the world YOU grew up in. Your lessons are irrelevant at best and detrimental at worst. We can’t get Redefinition for every project immediately, but if you we changed 1% every year, it might just redefine education on a lot of levels.